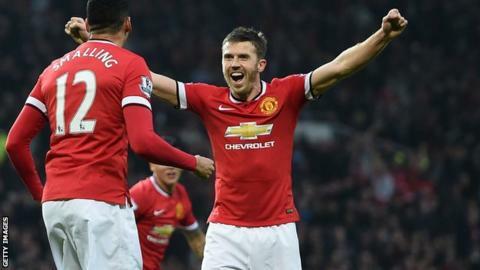 Manchester United manager Louis van Gaal has made midfielder Michael Carrick his new vice-captain. Darren Fletcher was given the role as deputy at the start of the season, but the Scot has been restricted to just 49 minutes since the end of August. Carrick, 33, has returned from an ankle injury to start all six games in United's current winning run. "I have three captains," said Van Gaal. "You have a sequence: Wayne Rooney is one, Carrick is two, Fletcher three." Ahead of Saturday's Premier League trip to Aston Villa, Van Gaal highlighted the sense of calm Carrick has brought to the United camp. "He brings a lot of experience but also a lot of composure," said the Dutchman. "He can transfer my philosophy on to the pitch." Carrick operated in the middle of a three-man central defence in the 3-0 win over Liverpool at Old Trafford last weekend. It is a role he is suited to, although Van Gaal does not view Carrick's switch from his preferred central midfield role as permanent. "Now we don't have Daley Blind, when I choose Carrick in defence, I miss him in midfield." In addition to long-term injuries Blind, Luke Shaw and Chris Smalling, Van Gaal will also be without Marouane Fellaini at Villa Park because of illness, while defender Marcos Rojo is ruled out by a thigh strain.